Caiophora coronata belongs to the loasaceae, a family of stinging plants which grow in South America. I first saw this plant in the high Andes in 1912 on a visit to Mendoza, Argentina, growing both in stony ground by the road to Laguna Diamante at 3000m in the high Andes and also on the north facing slopes below the statue of Cristo Redentor which is at the 4000m summit of the El Cumbre Pass between Argentina and Chile. The foliage looks very attractive with long silvery green pinnate leaves which glisten when damp - but do not touch as they are covered with tiny glass-like hairs which give a very nasty sting. 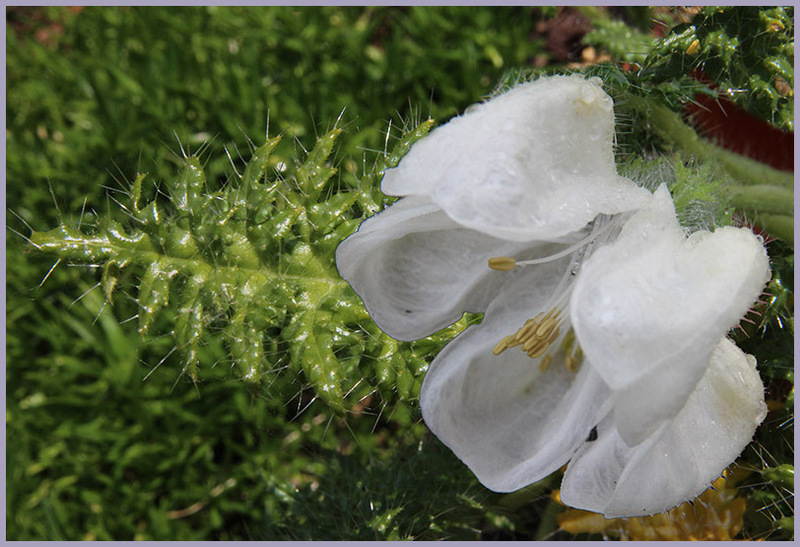 The flowers, 2-3 cm across, grow around the base of the plant as the name would suggest and again are eye-catching, looking like shining white lanterns. The plant is pollinated by small rodents which are able to avoid the protective foliage. 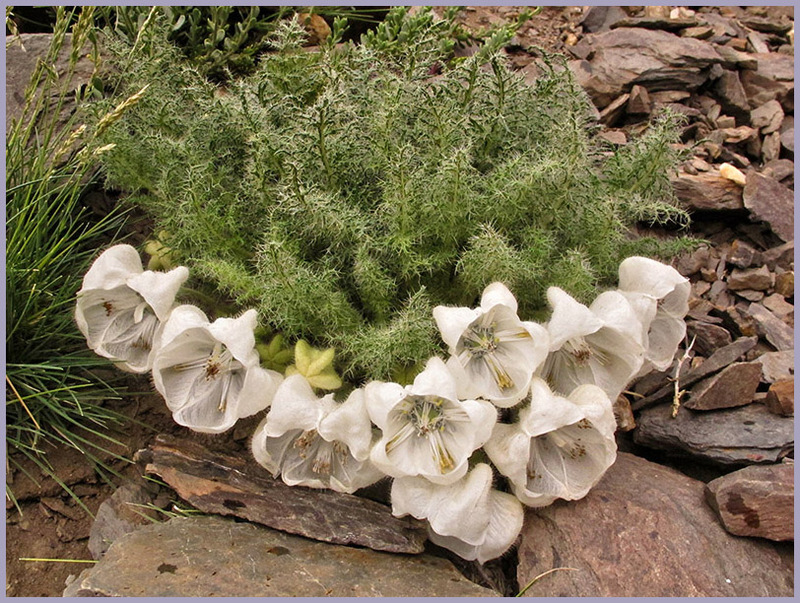 It is quite hardy, being able to survive under snow at high altitude and can tolerate low temperatures perhaps as low as -20C but does not like winter wet. When I noticed seed from Mendoza available on Votjech Holubec’s seed list I was tempted and sowed seed in January 2015. By the summer I had two healthy looking plants which I kept under glass until this year. 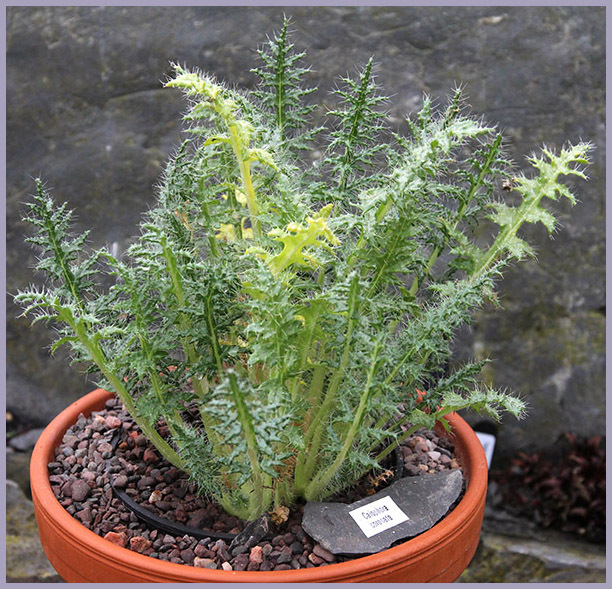 One was shown as a foliage plant at the Dublin AGS Show. In June one plant produced one of the coveted flowers and I decided to risk planting one plant outside in a sunny well drained site. I don’t think it enjoyed our wet Northern Ireland summer as it is now looking a bit bedraggled – perhaps the drier east coast of Scotland would suit it better. However it is such a striking plant I shall try to suit it even if it has a sting in its tail !